Natural resources are resources that exist without actions of humankind. This includes all valued characteristics such as magnetic, gravitational, electrical properties and forces etc. On earth it includes: sunlight, atmosphere, water, land (includes all minerals) along with all vegetation, crops and animal life that naturally subsists upon or within the heretofore identified characteristics and substances. Particular areas such as the rainforest in Fatu-Hiva are often characterized by the biodiversity and geodiversity existent in their ecosystems. Natural resources may be further classified in different ways. 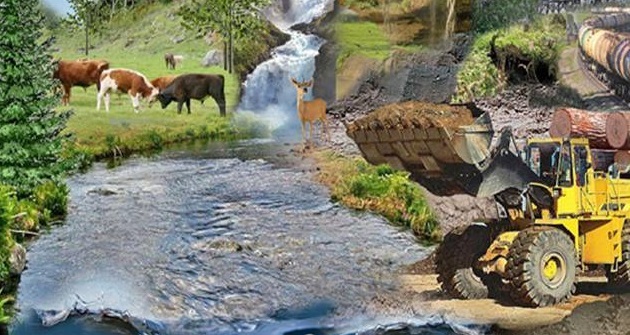 Natural resources are materials and components (something that can be used) that can be found within the environment. Every man-made product is composed of natural resources (at its fundamental level). A natural resource may exist as a separate entity such as fresh water, air, and as well as a living organism such as a fish, or it may exist in an alternate form that must be processed to obtain the resource such as metal ores, rare earth metals, petroleum, and most forms of energy. There is much debate worldwide over natural resource allocations, this is particularly true during periods of increasing scarcity and shortages (depletion and overconsumption of resources). Biotic в Biotic resources are obtained from the biosphere (living and organic material), such as forests and animals, and the materials that can be obtained from them. Fossil fuels such as coal and petroleum are also included in this category because they are formed from decayed organic matter. Abiotic ж Abiotic resources are those that come from non-living, non-organic material. Examples of abiotic resources include land, fresh water, air, rare earth metals and heavy metals including ores such as gold, iron, copper, silver, etc.